Import documentation process in Saudi Arabia, in detail. What is the certification process to import to Saudi Arabia? What are the documentation procedures as an importer in Saudi Arabia? 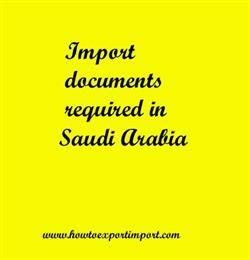 Types of documents required in Saudi Arabia to import goods? Information provided here describes about documents required by each import in Saudi Arabia which need to be submitted with customs officials for the clearance process. Meat products should specify that slaughtering procedures comply with Saudi regulations. Meats and poultry require a "Halal" certificate stating that the meat was slaughtered in accordance with Islamic law, and it must be legalized by a recognized Islamic Center. I. Notarized by a Notary Public and certified by a local Exporting country Chamber of Commerce. II. Certified by the Exporting country-Saudi Arabian Business Council. III. Legalized by the Saudi Embassy or any Saudi Consulate in the Exporting country. This post explains about various documents that every importer to be submitted with the Saudi Arabia Customs Authority in order to obtain clearance of the consignment. Customs documentation requirements to import at Dammam port. Documents required to submit with Dammam customs for importation. Documentation procedures for import at Riyadh customs. What are the documents need to be submitted to import at Jeddah port customs. Which documents should I provide at Medina customs port location for import. Documents need to move cargo out of customs at Dammam port customs location. Import documentation in Jeddah port customs. What are the documents required to import in Medina. What are the import document processes need to carried out with Riyadh customs. Required documents to import in AL JUBAIL port.